..not being a dumbass. Once you decide to care for the environment, being a dumbass is probably the biggest obstacle in your way. Oh how I envy organized people who’s head is firmly set on their shoulders. Example: Since I started this blog, I have been very careful to turn everything off from the plug, the phone chargers, laptop adapters and even the modem/router. I turned the water heater temperature down and have been zealously turning the lights off. And puff. One dumbass moment and its all gone (cough left cough iron cough on cough). I can’t even begin to count how many umbrellas, sunglasses, pens, books and even various types of clothes, scarves, gloves belts and hats. I have lost during my short life. They could probably fill a whole lost and found room with all the stuff I’ve lost. Being a dumbass is bad for the environment. My advice to you: don’t be like me. Thank you to The Worsted Witch for the original wording. I only wish I had used this when I was ordering my Diva Cup and my Reusable Bags stuff. Duh. But now I know better. No guarantees they will actually listen to you, but there is always hope. 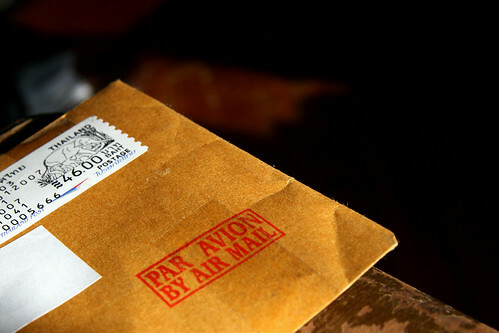 And there is also a better chance that they will eventually respond to popular demand of eco-friendlier packaging. Photo by Miskan on Flickr. A couple of days ago, Emily was worrying about whether the fact that her municipality collects all the recyclables in one bag means they are just landfilling them. As it turns out, that is quite a current and relevant question. The answer is, no, fortunately, they are indeed recycling it. Just yesterday, Treehugger had a great post about a new recycling technology that optically separates materials like different types of plastic and paper. That means that they now can sort the recyclables automatically, where traditionally people were required. I highly recommend reading the original article in the Economist. It is quite informative, for those of you who are still curious about recycling ‘magic’. Anyway, the point is, with the new automated sorting, many recycling programs are switching from several recycling bins to a single bin. The main advantage of the switch is that the recycling rate tends to be much higher with a single bin. 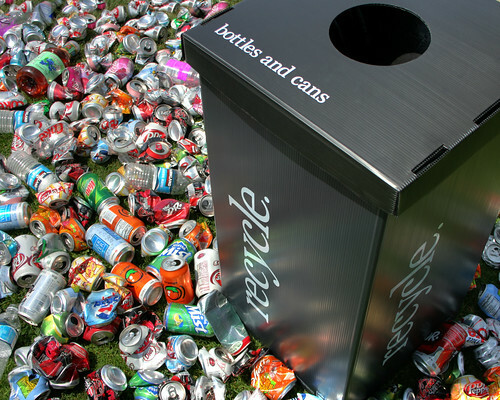 As an example, San Francisco, who switched to single bin a few years ago, now has a recycling rate of 69%. I don’t know if you realize, but 69% is huge! By comparison, the American average is 32%. Also according to the Economist, the recycling rate here in the Netherlands stands at 60%. Not bad if you consider they don’t collect plastic from households. I do, however, think that there is plastic being collected and recycled from businesses and other large producers. I mean, there is a European Directive that makes it mandatory for them to recycle a certain amount of plastic. So, my friends, if some time in the future your municipality asks you to put all your recyclables in one bag, worry not! It’s a good thing! Oh and sorry, Treehugger, for ripping off the image from your post. It’s just so pretty and informative… I hope you can forgive me. I do it out of reverence to you. No, sadly, the Carnival of the Green is not being hosted here. For that, you will have to wait until March 3rd 2008. But, my recycling post is being featured on the Carnival, this week being hosted on Groxie, and has made an appearance on a few other blogs. Here are the big news. I finally decided to, literally, put my money where my mouth is, and get my very own domain name. From now on, www.closetenvironmentalist.com is up and running! And I even made sure to register it at Dreamhost, who proclaims to be green on the account of buying Renewable Energy Credits and Carbon Credits. Better than most, I say. A: Well, I never do actually, I admit it. That is considered a ‘residual contaminant’, which is acceptable to some extent. So, no, they don;’t get tossed. It is better that you remove it, yes, because the quality of the material is better if the plastic is more ‘pure’. BUT. Most plastic is downcycled, which means for example, when you recycle soda bottles they are turned into garden pots or fleece stuff. So it really is up to you. If you feel like ripping them off, rip away! A: Ok, I’m not quite sure what shrink wrapped is. You mean, like the label of a coke bottle? If it comes of easily then it doesn’t hurt to take it off. But I don’t think leaving the label on is basis for rejection. A: Yes, definitely. You don’t even have to clean it as well. Just rinse it off. It doesn’t matter if glass is still greasy, because the high temperatures take care of it. Q: What about broken window (or picture frame) glass? I’ve heard this can’t be put in either? True? A: True. Broken window glass is a big no-no. Q: What about the plastic bags from cereal boxes? Or the bags with the “ziploc” type zipper that you can get with everything from pet foods to organic sugar? A: Cereal plastic bags, and other UPOs (Unidentifyable Plastic Objects) – depends if your local recycling takes all kinds of plastics or just #1 and #2. If it’s the former, then you can, if it’s the latter, then you can only put in plastics that are identified as such. In this case, they will discard all other kinds anyway. Ziploc bags – are made of nice plastic #1 PET. Yes you can recycle them. But why don’t you reuse them first, to store veggies or herbs or what have you? 😉 If they are clean, you can reuse them. If you can’t reuse them because they are greasy then you can’t recycle them either. By the way, while I was digging for answers to these questions, I found this little game. Are you aware? Check it out. 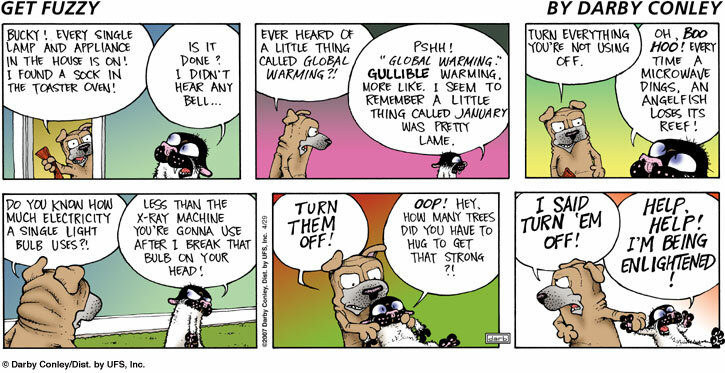 I just couldn’t resist posting this strip from Get Fuzzy, my favorite comic strip. It describes my kitty dialogues very accurately. It’s now been more than one month since I started this blog, and taking all things environmental a little more seriously… So I guess it’s about time to have a little recap on our “struggle”. I know this is kind of a random time for a recap, but please, be patient with me. Take into consideration that this is the blog of a highly UNorganized person, who probably qualifies as Attention Defective. Such is my condition, condemned to starting blogs on ordinary days, and having random unannounced recaps. And I am a little short on time and blogging topics, and it finally seems like I have enough to recap about. I still can’t stand tofu… My taste buds reject it like my cat rejects eco-litter. Lucky I didn’t leave any surprises around the house like some orange citizen I know (who will remain anonymous to preserve his dignity). I kinda dropped the ball on monitoring my utility bills… I have no idea how much money, if any, I am saving. I know this sounds strange but we’ve had this arrangement 1,5 years now. The bills are included in the rent and we are adjusting it when we move out. The freezer is unplugged! Hoorray! Bringing Your Own Bags is old news here, everyone does it (plastic bags are a expensive commodity here, you know). So I took it to the next level, where I am viciously storing and reusing EVERY single bag I already have. This includes stuffing my totes with paper bags for fruit and veggies on the verge of disintegration, piles of price stickers on top of each other. I am also religiously reusing egg cartons. If the eggs are not packed yet I just put them in My Own Carton. At one organic stand at the market, I ‘exchange’ my empty cartons for a full carton, their cartons are all reused as well. We are now unplugging all our electrics from the socket. Except the microwave… I use it as a watch in the kitchen. Being disorganized also means having improvised watches, like the cell phone, the microwave and the church tower. I recently discovered that we are actually using green electricity here. I would never suspected that of my landlords, judging by the stashes of disposable plates, cups and utensils we inherited. Oddly, I found out because it says so on the mailbox sticker. Awsome! I am growing herbs on the balcony, which are just starting to be big enough to use. We are also growing arugula and spinach (even though I’m pretty sure I’m messing up the spinach). We are buying organic veggies exclusively (unless there is dinner emergency), and buying as local as possible. And strangely, I don’t think I am spending much more money than before. At least not enough to notice. What I am noticing is that we are buying less quantities of veggies, and using them. Because organic stuff is so expensive, we really cut down on food waste. When we were buying the cheapest, we would often get a bunch of stuff and let it go bad. We stopped relying on meat for every meal. Now we have an agreement on once-a-week meat, but ironically, we forgot to honour it this week. Our tasty organic steak this week was, sadly, replaced by some crappy supermarket salami. And finally, a very satisfying change is that I don’t buy my stuff at the supermarket anymore. Now I just go there on emergencies, like the above mentioned dinner, as well as breakfast and litter emergencies. That means that I am also avoiding the plastic invasion of my kitchen by the packaging army. Oh, and I almost forgot! I got the Diva Cup, no more disposables for this gal!